The Forest of Bowland is an area of richly diverse landscapes, wildlife and heritage and has its own distinctive sense of place. The Heritage Lottery-funded Landscape Stories project, which ran between April 2009 and March 2011, aimed to uncover some of these layers of natural and cultural history, encouraging local residents and visitors alike to understand and celebrate this very special place. The project focused on four main themes: archaeology and historic landscapes in the Forest of Pendle; dairying and cheese making around south west Bowland; traditional chair making in the village of Chipping and the lime industry in the upper Hodder valley. 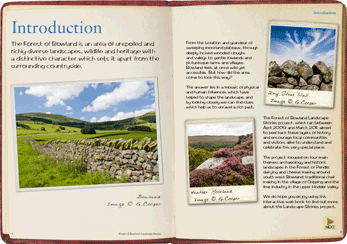 This interactive Landscape Stories book is one of the legacies of the project. We hope you enjoy exploring it!